This recipe comes from Chef Devin Alexander’s new cookbook, “You Can Have It”. 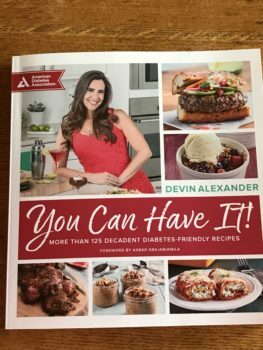 When I got an email to review this book, I was most interested as it is labeled to be a diabetic friendly cookbook. With both a father-in-law and a niece who suffer from diabetes, I am always on the lookout for recipes I can make for them when they visit. So when I got the opportunity to take a look at this book, I couldn’t resist. 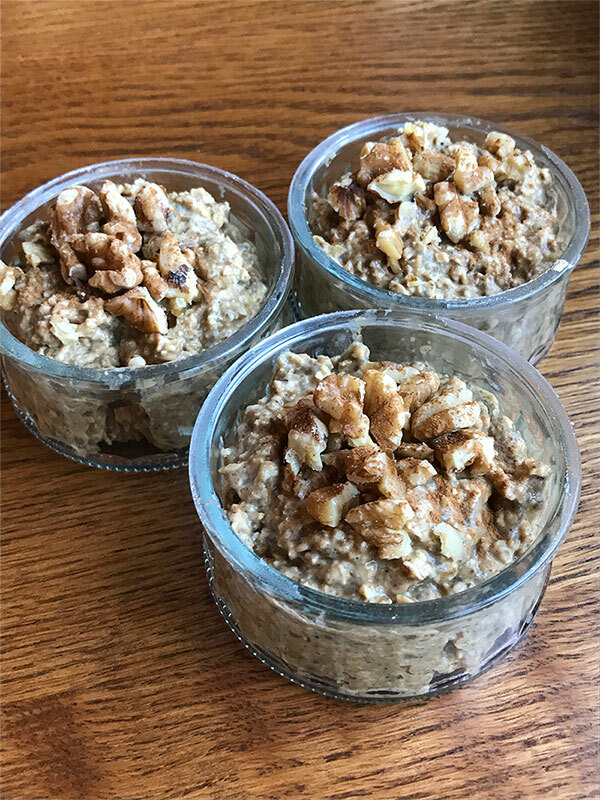 I love the warm spices of ginger, cinnamon and cloves so when I came across this recipe for the Gingerbread Overnight Oats, I was intrigued. Not only did I already have all of the ingredients on hand, it look super easy. 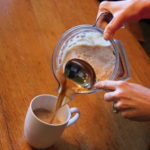 Like everyone else, my mornings are a busy and to have something pre-made that I can grab and go saves time, which makes getting out the door a little easier. This recipe could not be any easier and is super quick as all the ingredients are tossed together in one bowl. I like to double or triple the recipe so I can have extra on hand for the week and then store it in one bigger bowl in the fridge. That way I can just scoop the amount I want in a serving dish or to-go container. 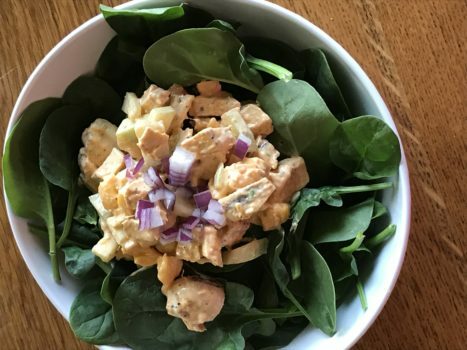 I have also made the Curry Chicken Salad from the cookbook, which came out quite tasty. Other recipes in the book which are on my list to try include; Caramelized Sweet Onion Balsamic Burger, Apple Fries with Creamy Peanut Butter Dip, Lemon Blueberry Ricotta Tarts, Sweet and Spicy Pomegranate Pork Tenderloin along with quite a few others. What I love about this cookbook is the simplistic approach Devin creates with these recipes. They are easy and flavorful without using a long list of ingredients. In small mixing bowl combine all ingredients except walnuts. Transfer to serving dish and cover with plastic wrap. Refrigerate overnight. 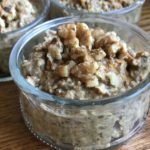 Top with walnuts just before serving. 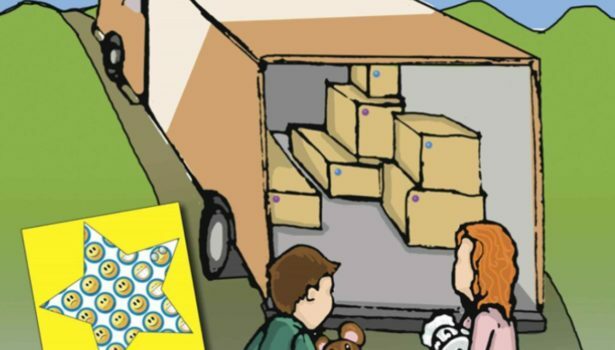 Moving at any age can be quite an adjustment as I have learned from personal experience. The end of this article will have few tips from me on how I am coping with my own personal move as an empty nester. You’ve Survived the Move . . . Now What? The house hunting is done, the boxes are all in, and you are in your new home! All is perfect, right? It will be, but may not be just yet! In reality, the next chapter has just begun, and you want to write it carefully. Settling into your new house can be an exciting experience, but don’t overlook the necessary steps to make it “HOME.” Here are a few quick steps to making that house a home to ensure everyone is on board with setting up the space to best accommodate your family. Let the children have a say in some décor—perhaps it’s a paint color for their room, or input on the wall where the couch will be positioned. Your children’s involvement will add a delightful personal touch. It’s now HOME. Offer some consistency. Yes, it’s a new house and fresh start, but did you have a staple painting in the last eating area? Was the snack cabinet set up a certain way? You will find there are natural things you do for your set-up (e.g., glasses go in the cabinet above the dishwasher), but don’t overlook the chance to create consistency in areas that are seemingly insignificant to you because they offer familiarity to the children. Be efficient and get settled as soon as possible. This is easier said than done. You are exhausted from the move. Oh, and you still have jobs and a family to take care of. However, the sooner the house is settled (you know, the “main” stuff . . . your box of high school trophies that has followed you for years can stay unpacked), the sooner the kids will acclimate. Children are resilient; the sooner they can depend on stability in their surroundings, the sooner they can get comfortable. Have a party! Big or small. Celebrate the new home. Regardless of why you moved and if this home is bigger, smaller, better or worse, it’s yours! Celebrate new beginnings. 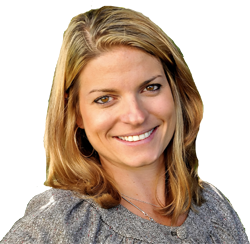 Also, make a specific point of paying attention to the things your kids point out to guests—you will find they will be very open while giving a tour. Take note of the positives you can further accentuate or the “negatives” you could improve based on their perception. Finally, and most importantly, give yourself a pat on the back. You are on the other end of the move and despite the late nights, details, and boxes, you are in. Your kids know how hard you worked; time to enjoy with them . . . after you give yourself another cup of coffee!! I so wish there was adult version of this book. It would have been helpful in my case. My move came right at the same time both my kiddos who are only 13 months a part, left for college. I was a stay at home mom and all of the sudden found myself alone in a new city. I was a bit of hot mess and am still working on things. I am in no means an expert, and I am sure there could be material out there concerning this topic for adults. For some reason I never thought to look into something like this for adults until I got this information about the book. 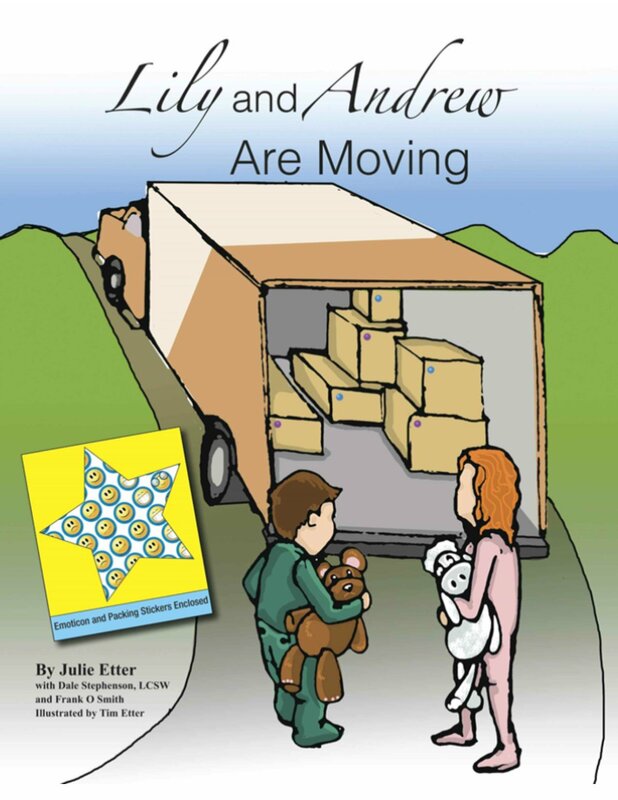 Although, this book is geared toward children, I thought since we are addressing the topic there might be some adults expiring anxiety from moving like I did and still do from time to time. In the meantime, while I do some research on finding an adult version concerning moving, I thought I would share some things that have helped me in the in the four years we have been in our new home. My husband travels quite a bit for work and being an empty nester, I tag along quite often. If this is an option for you, I highly recommend packing your bag and tagging along. Even if you will be stuck at a hotel all day, it is better than sitting home alone. Join a gym, club or community center. I know you won’t feel like it, but exercise is key to get you out of the funk you may be in. We joined a country club that has a fitness facility and it has changed our lives. Not only can we work out, the club offers a variety of activities and social gatherings where we have met some great people. Learn to play pickleball. I know this sounds silly but it is one of the best things I have ever gotten involved in. It is still a fairly new sport, but many community centers and parks around the US are catching pickleball fever. There are often mens, ladies and mixed groups that play on certain days and times. It’s a super easy sport to learn and a great way to make new friends and socialize. It is a combination of tennis and life-size ping pong. You can read more about the game here. Try to find other people that are new to the area as well. We have made a few friends that were in the same situation as us and to have someone that is experiencing the same thing, definitely forms a bond of some sorts. I am so grateful for these new friends. We call ourselves a “framily” because you need people around you who are like family and can help each other out. If it is relevant to your beliefs, find a church. We are still working on this one…..
Lastly, get yourself some help or medication if you need. I have done both, I can’t say the counseling helped me much. It almost made me sadder in a way talking about home and my kids. I tried Zoloft and did not like it. You can read about my experience with that here. I switched to Wellbutrin about a year and a half ago and have to say I feel much better on it. Again, I am no expert but do know what it’s like to be in new city alone. If you find yourself in the same situation I hope some of these tips will help you out. Please feel free to comment or email me with any tips, questions, comments you have or just want a friendly shoulder to lean on. 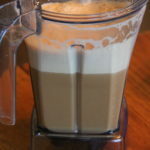 This almond date latte is a recipe my husband created a few months ago while on the Whole 30 diet and we have been making and drinking it every morning since. Sugar and sweeteners are omitted on this diet so those who like their coffee a little sweet need to get a little creative. The Whole 30 diet is based on specific whole foods. When we saw dates were acceptable that was the answer to adding some sweetness to the coffee. 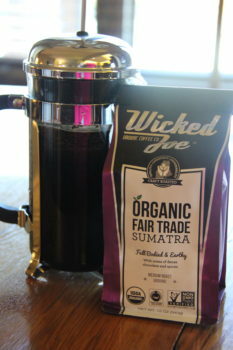 When I was offered a sample of the Sumatra blend coffee from Wicked Joe, I thought it would be great to try it in this recipe. The Sumatra blend is a delicious coffee with notes of dense chocolate and spices which pair perfectly with the cinnamon and coconut oil that goes into the recipe. 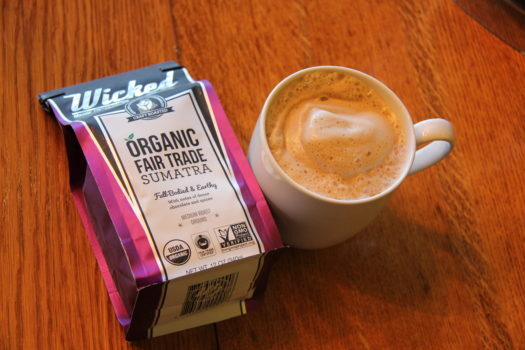 Wicked Joe is a family-owned coffee company based in Maine serving up 100% certified organic, fair trade and non-GMO verified coffees. They roast their beans in a state of the art energy efficient facility using sustainable business practices from crop-to-cup. To complement their sustainable business practices all of Wicked Joe coffee beans are purchased directly from farmers and cooperatives across the globe. 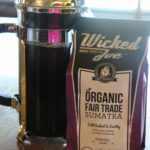 Wicked Joe offers a variety of blends and single origin coffees which include Sumatra, Honduras, Bali, Ethiopia, Costa Rica and more. 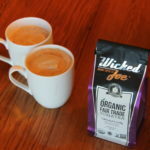 The Wicked Joe single origin varietals are imported directly from the country from which they are grown and are not blended with other coffees. 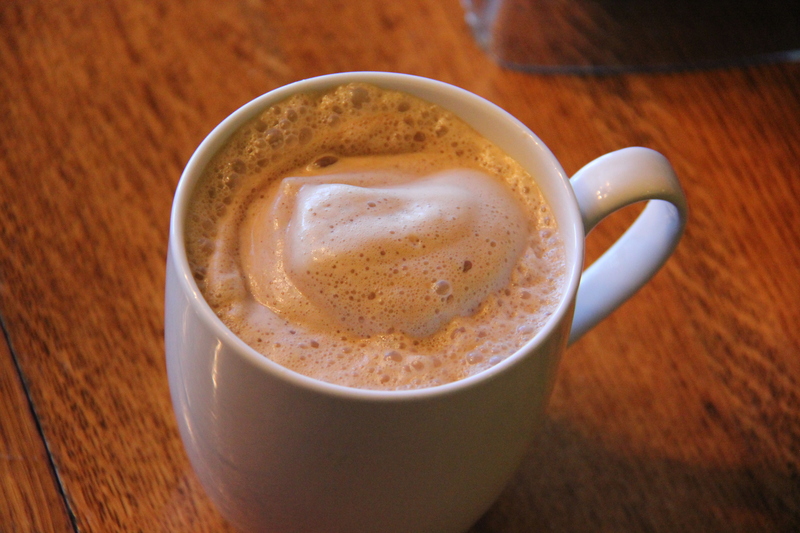 This latte recipe is super easy and delicious. 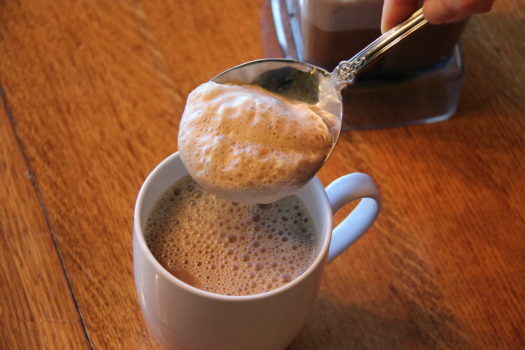 We like to use almond milk but you can use any milk you like. If you are trying to keep it Whole 30 compliant though, you will need to skip any milk with dairy in it. Pour milk into microwave safe mug or dish and add dates. Be sure to remove any pits in the dates. Even if you buy pre pitted dates, a pit can be hiding every now and then so double check them carefully. Microwave for 1-2 minutes until milk is warm and dates are soft. You can also do this on the stove top. Just combine milk and dates in saucepan and heat until milk is warm and dates are soft. Add coffee, date and milk mixture, cinnamon and coconut oil into blender. I recommend a Vita Mix. Place a towel over the top lid in case the coffee leaks out the top when blending. Start blender on low speed to get it going and then increase to high. Blend until smooth. 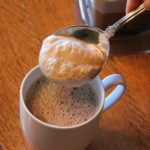 Using a large spoon, block the foam while pouring into mugs. Pour coffee about an inch from the top of the mug. Then top with desired amount of foam. If your mixture seem a little grainy and it bothers you blend a little longer. 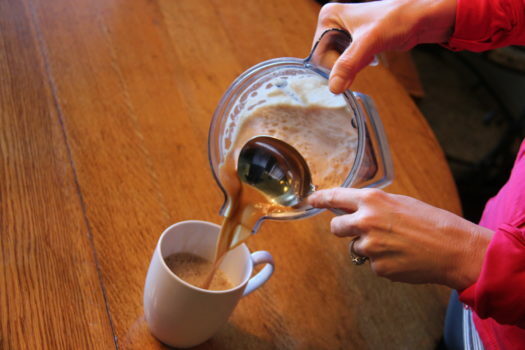 You can also place a fine mesh strainer over the mug while pouring in coffee. This roasted heirloom tomato and goat cheese dip is simple and the perfect appetizer to impress guests or take to a party. 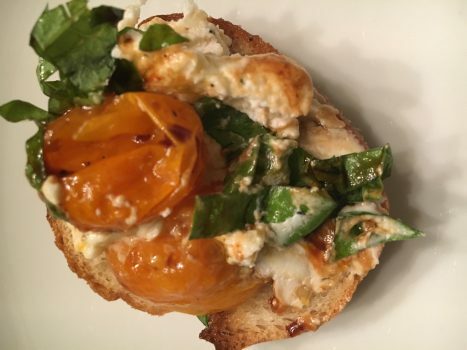 As an ambassador for Whole Foods Market I get to create and share a simple recipe using great products and produce that are in season and available at Whole Foods Market. 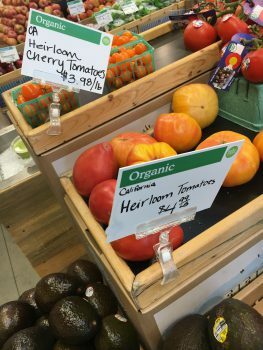 At the moment this includes delicious heirloom tomatoes. I wish to thank whole foods for providing me with a gift card to purchase the ingredients. 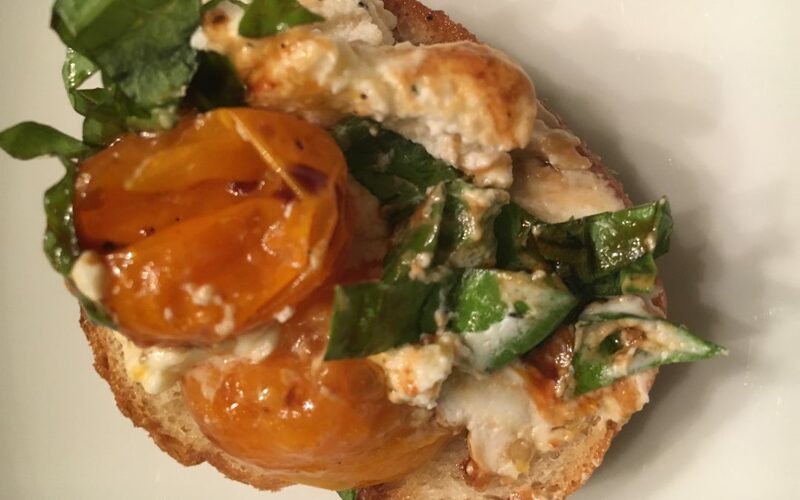 Here are some tips and recipes from Whole Foods Market along with my recipe for the roasted heirloom tomato and goat cheese dip. Enjoy! Tomatoes should feel heavy for their size, be soft and yield only slightly to the touch. Size has no correlation with quality — large tomatoes can be just as delicious as small ones. Also, avoid tomatoes with open splits and cracks. Only purchase what you can eat within a few days. Tomatoes should be stored at room temperature, not the refrigerator because it destroys both flavor and texture. Here are a few favorite varieties! Cherokee Purple. This very large, beefsteak variety is purple or very dark red. It’s deeply flavored and rich with a firm, dense texture. Slice these tomatoes thickly and serve with brined cheeses such as feta or with a sweet drizzle of honey. Marvel Stripe. This large, beefsteak variety is yellow with interior blush. It’s mild, sweet and fruity with low acidity. 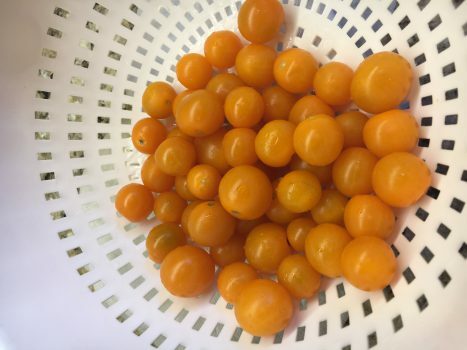 These tomatoes are juicy and soft and are wonderful for gazpacho, paired with balsamic vinegar as a tomato relish or with earthy clothbound cheddar cheese. Brandywine. This is another large, beefsteak variety, however these tomatoes are pink or yellow and sweet with low acidity. 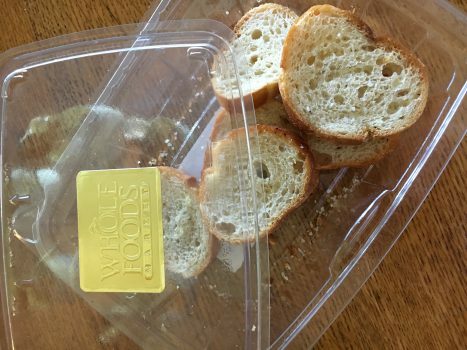 They are perfect for sandwiches, used as the base of a fresh summer salad or paired with the creamy saltiness of Parmigiano Reggiano. Evergreen. This is a medium to large, beefsteak variety. They stay green when ripe and are mild and sweet. Make tomato preserves, a sandwich with triple crème Brie and baguette or bread and fry slices for fried green tomatoes. Black Prince. This is a medium-sized, round globe variety that’s purple or very dark red. It’s deep and sweetly flavored with a firm texture. Sprinkle wedges with vinaigrette and fresh herbs for a simple treat; pair with Rogue Creamery Oregon Blue to match the tomato’s sweetness. Sun Gold. This small, cherry variety is dark yellow or almost orange. These tomatoes are tangy-sweet and perfect for an anytime snack, tossing into quick salads, baking on pizzas and flatbreads and pairing with Parrano cheese. Black Cherry. This small, cherry variety is purple or dark red, very sweet and highly flavored. They’re great in salads, roasting whole, baking into focaccia and pairing with Monterey Jack for a cream-of-tomato soup flavor combination. 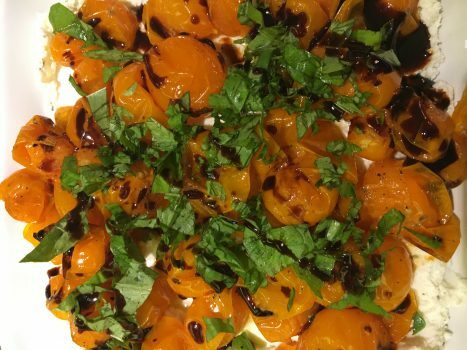 Here is my favorite heirloom tomato recipe. 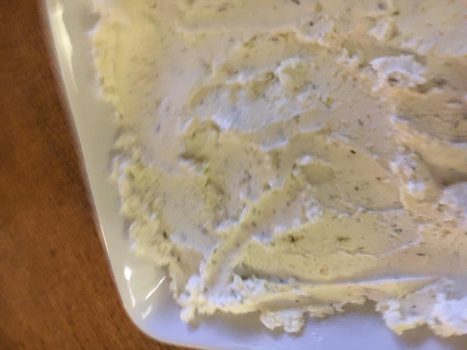 I love serving this dip with the Whole Foods Market house made crostini but you could use and cracker of bread of your choice. 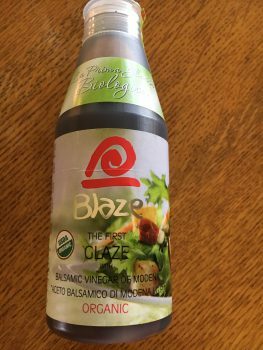 The balsamic glaze is sold in a squeeze bottle that is usually found in the oil and vinegar isle at the grocery store. You can also make your own by using regular balsamic vinegar by pouring 1/2 cup vinegar into a sauce pan and then bring to a boil. Stir consistently until vinegar begins to thicken. Remove from heat and let cool. Store unused glaze in an airtight container at room temperature for up to a month. Heat oven to 425. 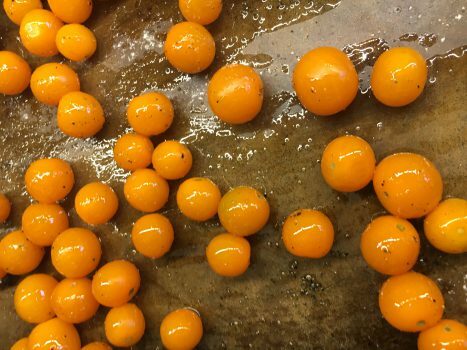 Rise and pat dry cherry tomatoes and place on baking sheet. Drizzle tomatoes with olive oil and sprinkle with salt and pepper and toss to coat. 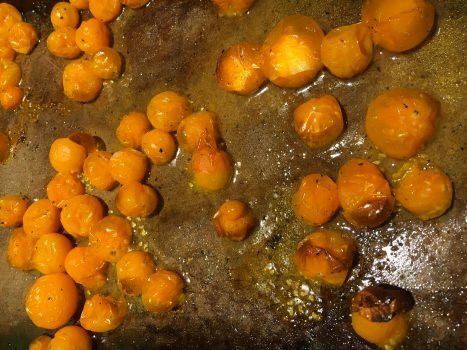 Roast in the oven for about 20 minutes or until cherries began to burst and caramelize. 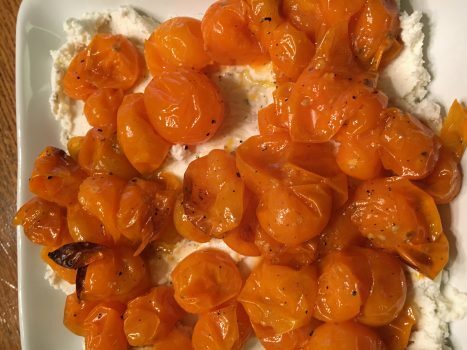 While tomatoes are roasting, place goat cheese in mixing bowl. Add minced garlic and Italian seasoning. Remove tomatoes from oven and cool slightly. 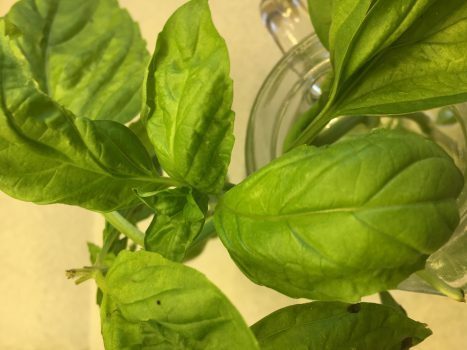 Chop fresh basil and set aside. 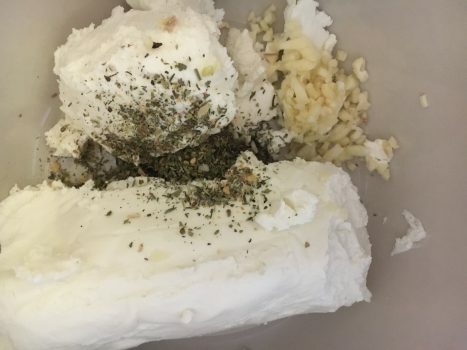 To assemble spread goat cheese on serving platter. Top with roasted tomatoes. Sprinkle with fresh basil. Drizzle balsamic glaze over top just before serving. Serve with cracker, French bread or crostini of choice. 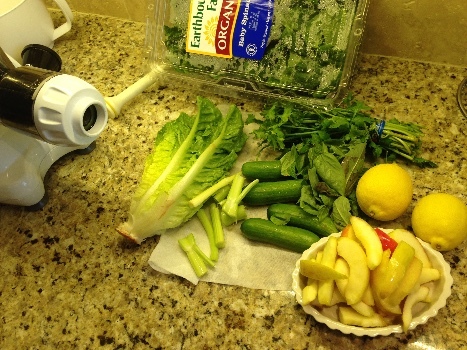 I bought a Juicer a few months ago and have been juicing up whatever I have on hand or needs to be juiced up. This mornings juice came out quite tasty and very refreshing so I am sharing the recipe for those other juicing fanatics out there. Wash and prepare all produce and run through your juicer. It is ready in minutes! 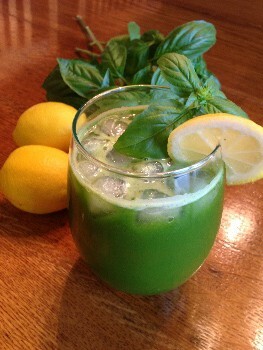 The fresh basil and cilantro really give this juice great flavor!